If curiosity and a mouthwatering smell brought you in Florence, queueing for a lampredotto behind workers with paint on their trousers, clerks with loosened ties, brave tourists with worn-out guides in their hands and young people with a huge appetite for life and food, be ready to make decisions. Do you want the bread to be soaked with broth? hot sauce? green sauce? just salt and pepper? 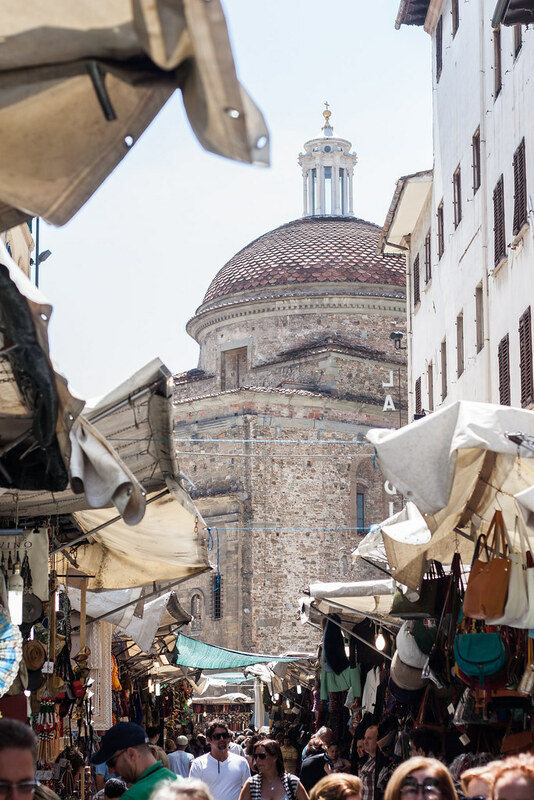 You can have your personal defining sense of self in an ordinary day in Florence. As you might have understood, this month’s Italian Table Talk round-up is about Italian Street Food, a favourite of foodie people always searching for outstanding quick bites with a gourmet appeal. If you never cease to seek for the ultimate food experience, even standing under the rain queueing for a panino, navigating through work meetings to carve out a decent lunch break or stealthy following the locals to discover their secret places, this post is for you. Street food is one of the fast-tracks at your disposal – one of the most satisfying and rewarding, in my opinion – to get into the habits of a place you want to discover. If you want to understand a city, eat like the locals. This is what we’re going to show you today. Jasmine will lead you to discover a summer favourite, granita al caffé, while Valeria is showing us the typical Venetian street food, with bacari and chichèti. 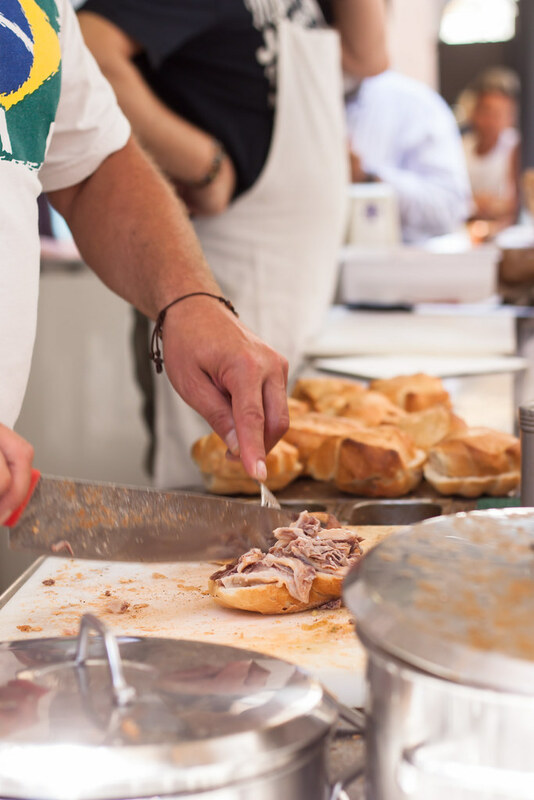 Then back to Tuscany, with Emiko‘s insight on the street food of the Etruscan Coast, the torta di ceci, and my quest to discover the best panino al lampredotto in Florence. Lampredotto, tripe and offal are a favourite of my blog, I’ve already had the chance to tell you about the Florentine love for quinto quarto, namely the fifth quarter, a pun to refer to the entrails left after the butchering of the meat into four noble parts for the peasants and poor people who slaughtered the animals in the ancient times. 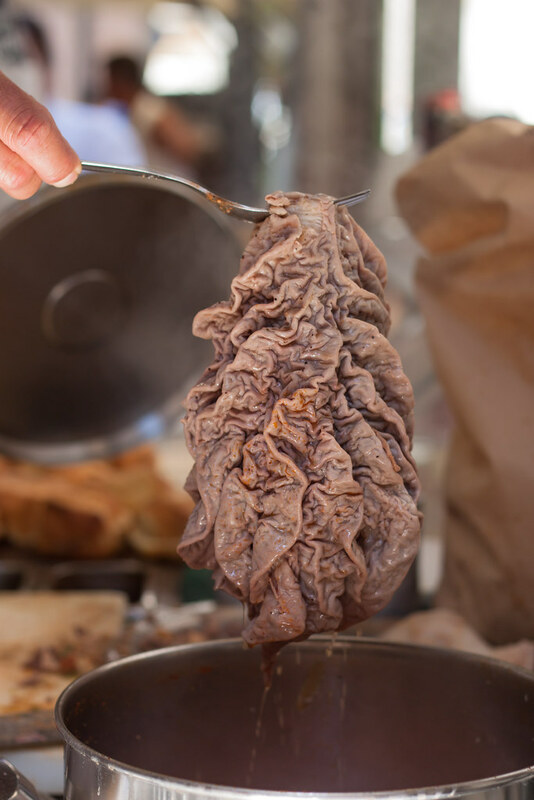 Those inventive and clever people made delicious food out of the entrails, leaving a long lasting memory into the Florentine food culture. 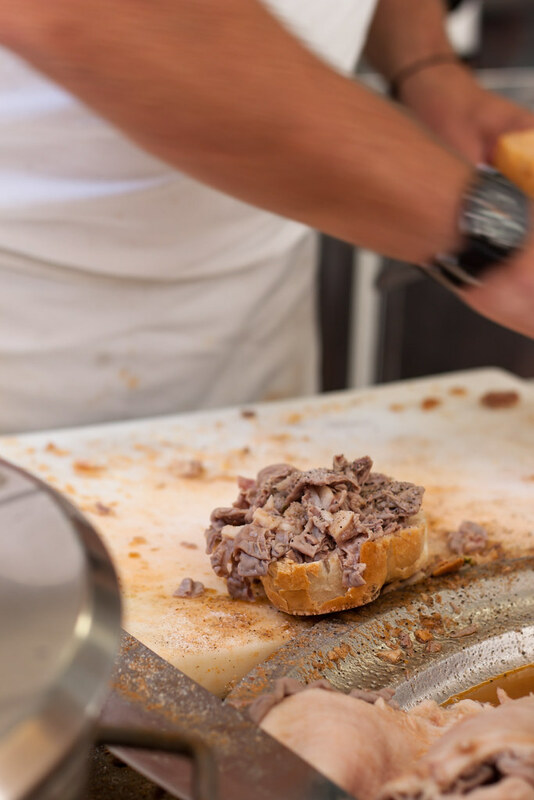 Lampredotto, the fourth stomach of the cow, was so typical of Florence that until a few years ago the trippai and lampredottai stands used to be located just in the centre of Florence, not even outside the city walls. 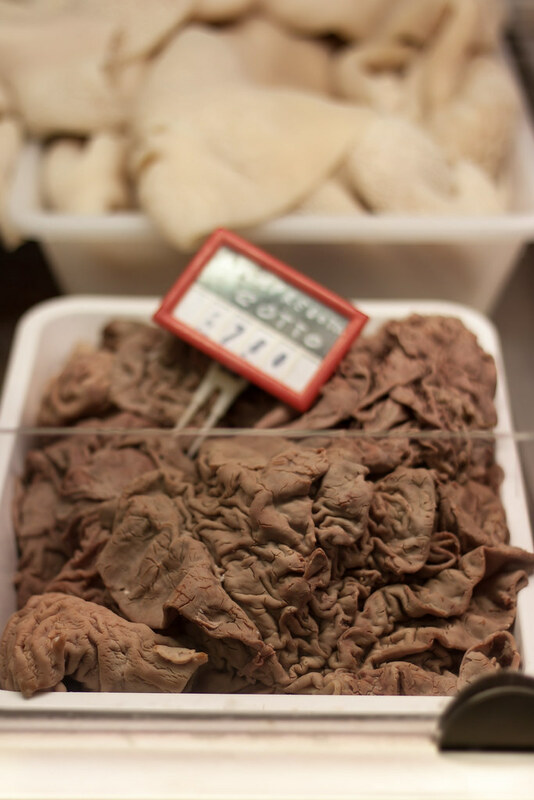 Now they are slowly spreading, reaching the suburbs and the nearby towns and cities like Prato, but it is almost impossible to find lampredotto outside the Florence area, and this gives to the lampredotto a special flavour. You know you are eating the real food of Florence. I started my lampredotto tour with Nerbone, following the advice that friends and connoisseurs were constantly giving me on Twitter. 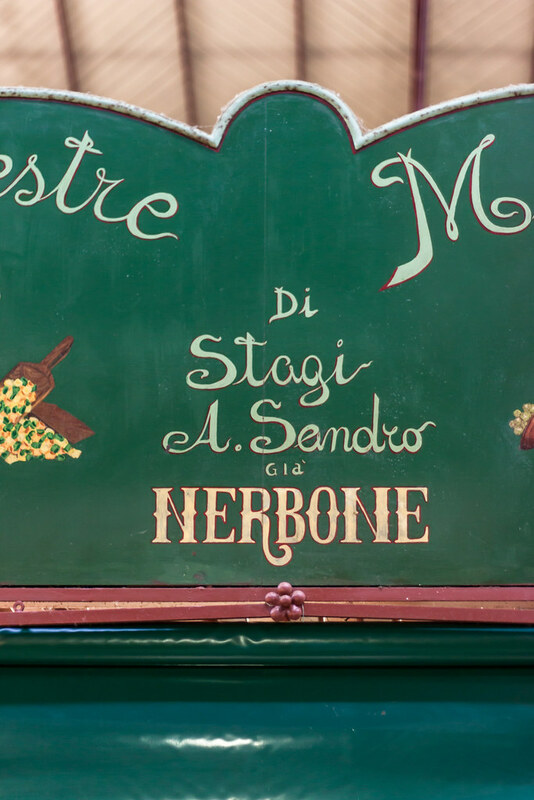 Nerbone is located just inside the food market of San Lorenzo, it has on one side a long old fashioned marble counter with busy people working behind it among pots of simmering broth and crackling pieces of porchetta. Order your food and take it on the other side, if you can find a spot, where you can enjoy your food in a space equipped with chairs and tables, where wroth-iron, marble and white tiles set the perfect mood for your lunch. Nerbone is renowned among workers and tourists, as you can tell from the long queue you have to face if you dare to have your panino during lunch time. I went there in the mid morning to take my time and enjoy my sandwich, just salt and pepper this time, to fully appreciate the savoury, smooth and tasty lampredotto, sitting on a bench and looking curiously at the other customers. There were regulars ordering il solito – the same panino as every day – and there was a nice middle aged Oriental woman, travelling alone from what I could tell, taking pictures of her panino al lampredotto and smiling to herself, proud of that discovery. Then I moved on to the next trippaio to meet some friends. 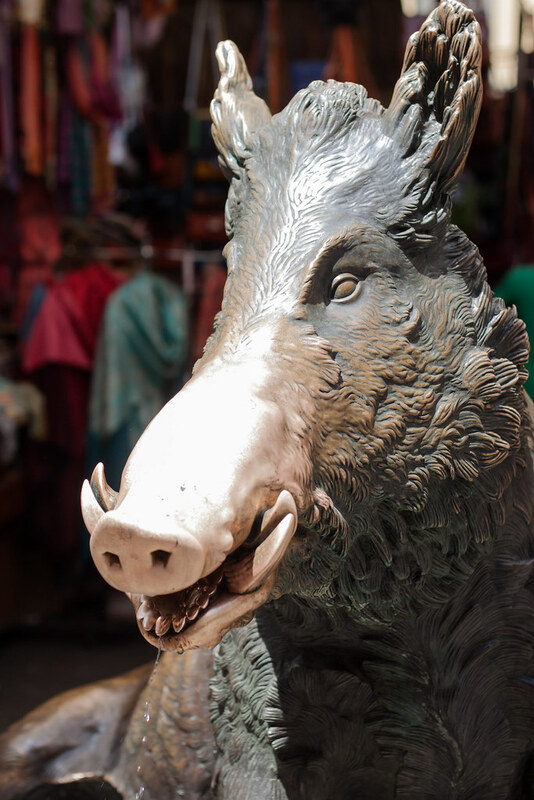 We chose to visit il trippaio del porcellino, Orazio, who owns a stand in Piazza del Mercato Nuovo, best known as Porcellino, a few steps from Ponte Vecchio. There’s a family history behind that stand: he’s being a trippaio for almost 25 years, as his father before him, his grandfather and his great grandfather. I asked shyly if I could take some pictures and put him a few questions for an article I was writing, and he said, amused: are you writing a book on tripe, too? You’re not the first today who came here to take pictures, tripe is really getting famous nowadays, isn’t it? He looked like the perfect person to talk with, so I fired up the first question, hoping it wouldn’t end up with a secret ingredient: Orazio, which is the secret to make such a delicious lampredotto? And how do you make the broth? he prompted. I named the few ingredients that I usually put in my classic broth, the same broth I use either to cook lampredotto or to boil marbled meat for bollito misto. It is just a pot full of water, then you throw in salt, onion, celery, carrot and a ripe tomato, I said. While I was enumerating the ingredients, he was nodding knowingly, then he replied: it’s the same broth we make here, I just use tomato concentrate instead of fresh tomatoes to give a reddish hue to the broth. So if the ingredients of the broth are the same, can you guess which is the difference? Then he went on, unfolding the passion, the secrets and the story behind a simple panino: the secret lays in the lampredotto itself, because the trippai have the first option in choosing the best and freshest offal of the just butchered animals, then what is left goes to the great distribution (where, I had to admit, I buy my lampredotto). 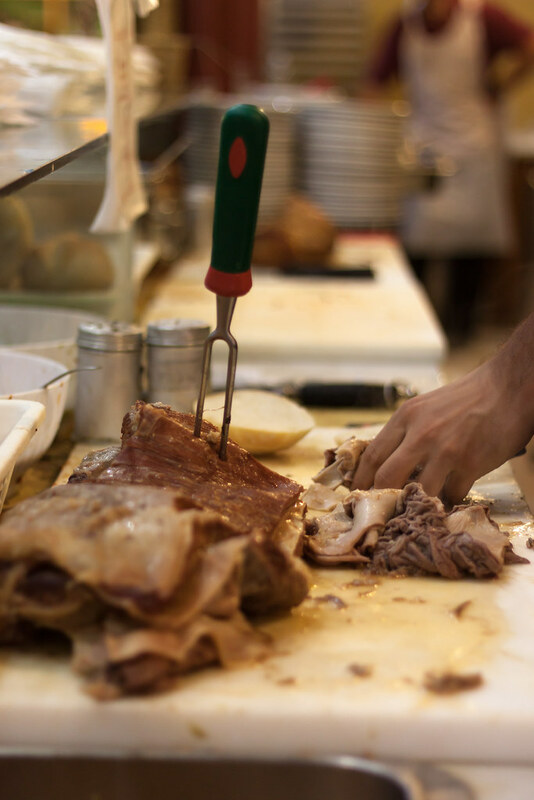 So if you want to make an outstanding lampredotto, he revealed skilfully filling a panino for a couple of tourists, you have to buy the lampredotto from your family butcher, as to be sure it is fresh and has a good quality. Then, he added smiling, you have to cook it in large quantities. It’s just like when you make ragu: if you make a tiny pot of meat sauce, it will have no depth and character. To have an impressive ragu you’d better put on the largest pot you have, add your ground meat and vegetables and a thick tomato sauce, then you let the pot rumble slowly on the stove for hours. When I make lampredotto, he proudly boasted, I cook 10 kilos of meat, not a few hundred grams, and you can tell the difference. Try it! And he handed me a perfectly made panino, a thin crusted bread with a soft and juicy filling, dripping a savoury broth, with plenty of salt and pepper, a tasty yet delicate tender lampredotto and a thick salsa verde, enough to add an extra depth without covering the other flavours. That was pure art. 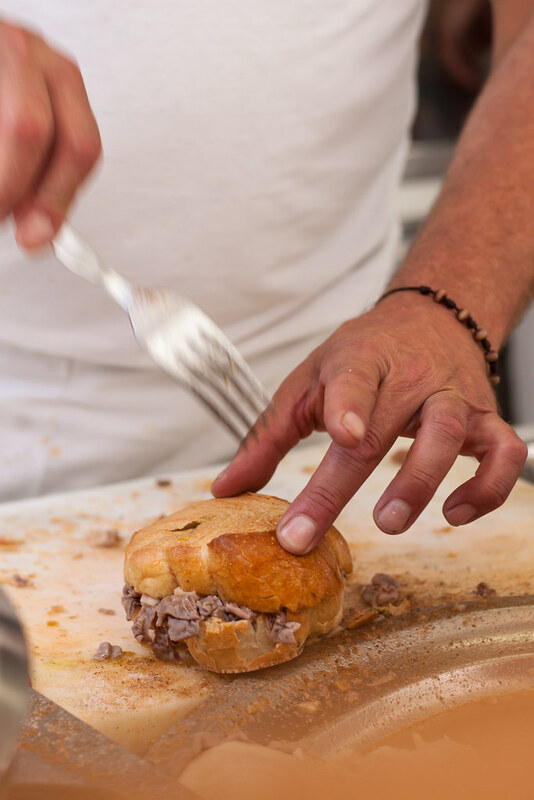 This is my recipe to make a perfect panino al lampredotto, just remember Orazio’s advice and ask your butcher a fresh lampredotto. iLampredotto, a free iPhone App to discover the map of the lampredotto and tripe stands in Florence, don’t miss it! if you’d rather use a real map, ask for the food and wine city map at the Florence Tourist Office just in front of the Santa Maria Novella train station. You’ll find many a good idea where to have your panino, just 1,50€. The hashtag to follow the conversation on Italian Table talk on Twitter is #ITabletalk (easy, isn’t it?). Let us hear your voice! Now head to my friends’ blog to discover other typical Italian street food. I am also curious to learn about the typical street food of your region or city, I’d be happy if you want to share advice and curiosities! An interesting speciality! I’m sure that sandwich tastes amazing. Lovely post Giulia, very interesting! Loving your Italian table talks! We visit Florence at least once a year & my hubs favorite is Lampredotto with salsa verde in a little cafe next to the Bardini museum, it’s not for me at all! Next time I’ll pay a visit there! Though Florence is one of my favourite cities to visit, I’ve never tried lampredotto – this is obviously a bit mistake! Next time. Thanks for the post, I loved finding out all about the roots and secrets and so on. Interesting! I never knew that was the specialty of Florence and I have been there… 😉 I do know that we still talk about all the amazing food we had while on our trip in Italy. It must have one of the worlds best street foods for sure. Next time we are in Florence (and there will be a next time!) we will make sure to eat lampredotto! As said to Emma, next time you’re in Florence we’ll organize a lampredottour, a tour you will never forget! I don’t know if I could try this after knowing what it’s made out of. 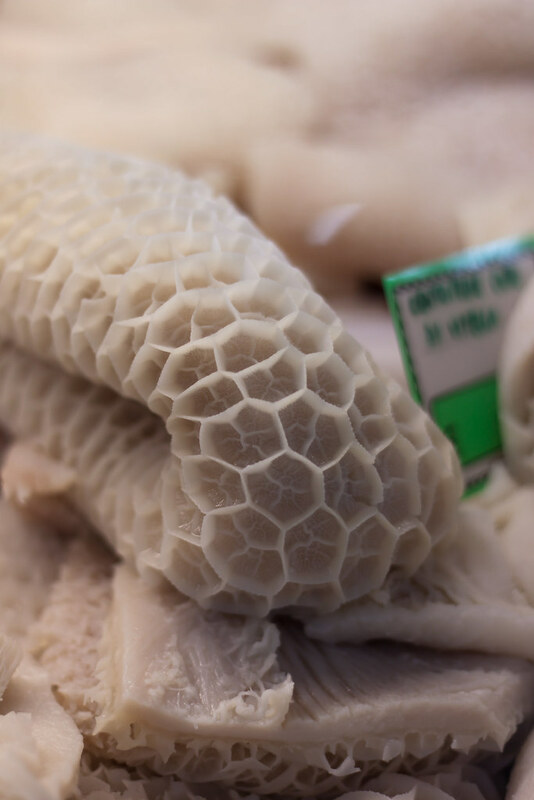 I’m still squeamish about eating tripe. But your descriptions and the story of your interview during your tour and discovery might make me brave enough. Excellent post! that’s so kind of you, I really thank you! How funny to see the opening quote from You’ve Got Mail a few minutes after I watched it (for a hundredth times) 🙂 I am thankful to you for this post as I am on my Italian cooking journey myself and like to learn about regions and food of Italy. that’s a movie I love! An Italian cooking journey? interesting! Looks like a great journey. that’s speaking!! maybe a little bit too far? anyway, it would be worth the journey – along with some other tasty Florentine food! I simply love your blog…discovered only days ago…because your bottomless, joy-filled and knowledgeable cuisine acumen is such a pearl among a net filled with food blogs..Yours excels. Also, this brings me back to the unforgettable year I spent in Florence as a university student where classes were held in the Piazzo Antinori…I always passed the “tripa” stands..wanting to try them..but my fellow students thought that would be crazy!…I did love the Cenchi…bomboloni…Biscotti di Prato (con Vin Santo)…famous hot chocolate at a place (starts with an R…Rivolli? )..that began the chocolate affection in Europe..but was sold only to nobles at the time?…café ristretto and cappucinis..gelati…osso bucco…I learned how to make gnocchi from my roommate’s Italian nonna in Reggio Emilia..discovered fennel as a delicious braised or raw vegetable…and, my fondest memory, was seeing school children buying castagnes?/chestnuts from corner vendors to keep their hands warm as the cold weather arrived.. Thank you so much for sharing not only your exquisite recipes..but your incredible knowledge of the tradition and history behind them. I so miss Firenze…Sienna…and especially San Giminiano..my favourite day-trip destination from the pensione! Hi Donna, please forgive me for my late answer. I was so happy to receive your comment, it is always so interesting to get a feedback from foreign readers that once lived in Italy! You really sound like a person in love with Florence, a great connoisseur, let me add! I just can depict in fron of my eyes the chestnut scene: I used to do the same, and still do the same! My mum was born in San Gimignano, so I used to go there every Saturday till I was 18, to visit my granddad. It is an enchanting town!